This peak is #14 in Prominence List for Alberta .The 3rd peak from the north, of the 7 peaks on the Mount Rundle Ridge. Sometimes called Rundle3. On 1:50,000 maps, it is under the borderline of the Canmore Nordic Center. The highest point of Mount Rundle is the 3rd summit from north to south. On the 1:50,000 map, the "Mount Rundle" label is sprawled across the entire range. For encyclopedia purposes, the location of Mount Rundle is the 3rd peak, with an estimated height of 2980m (based on counting the contours on the 1:50 map). 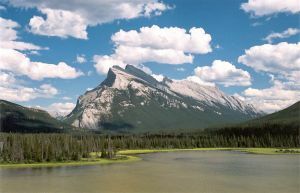 Geologists consider Mount Rundle to be a classic example of how the tilt of the bedrock can control the shape of a mountain. When erosion ate away at the northeast face, entire layers were able to slide down the southwest slopes into the valley, giving steep cliffs on the northeast side and a more regular slope following the surface of one of the layers of rock on the southwest. There are established sport-climbing routes on the East End of Rundle, above Canmore, and winter ice-climbs elsewhere. It is perhaps one of the most photographed peaks of the Canadian Rockies. Name Notes: Mount Rundle is named after the Methodist missionary, the Reverend Robert Rundle, who preached to the native peoples in the Banff area in the mid-nineteenth century.